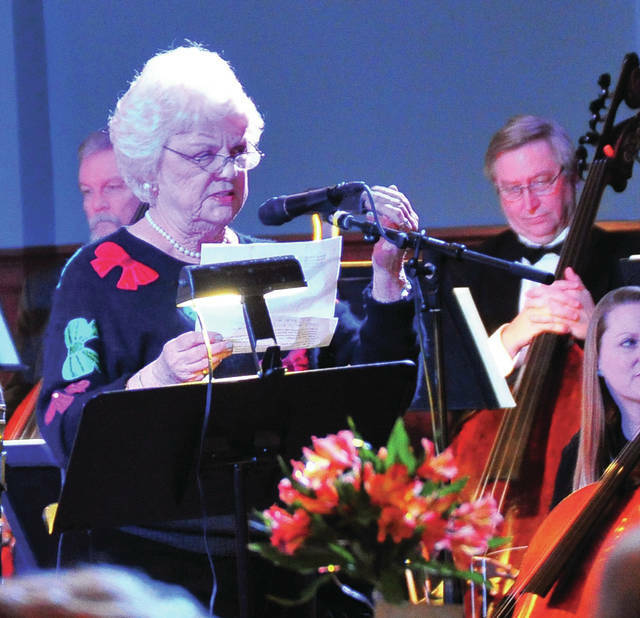 Mike Ullery | Daily Call A capacity crowd fills the Fort Piqua Plaza Ballroom as the community celebrates the 10th anniversary of the grand opening of the facility on Friday. Mike Ullery | Daily Call Ruth Koon, who was part of the committee to undertake the renovation of the Fort Piqua Plaza, addresses the capacity crowd in the Banquet Room on Friday during the 10th anniversary gala. PIQUA — The Friends of the Piqua Library hosted a special gala at the Fort Piqua Plaza on Friday evening to celebrate the 10th anniversary of the building’s completed restoration. The Fort Piqua Plaza, originally known as the Plaza Hotel or the Orr Statler Hotel, was built in the 1890s. The original grand opening was held on Oct. 27, 1891. The Fort Piqua Plaza reopened after its reconstruction efforts, which cost $22 million, were complete in October 2008. Ruth Koon of the Friends of the Piqua Library said that reaching this milestone for the Fort Piqua Plaza for everyone involved in its reconstruction efforts, like the Hotel Library Legacy Alliance, “tells us that we all did the right thing.” The Hotel Library Legacy Alliance was the private fundraising group for the restoration of the Fort Piqua Plaza. 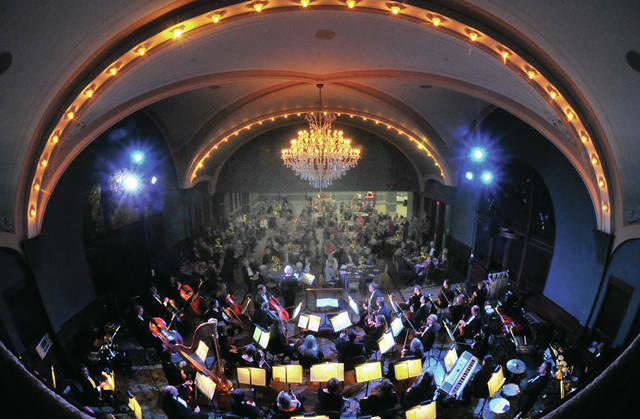 The gala featured the Dayton Philharmonic Orchestra with Artistic Director and Conductor Neal Gittleman. Numerous officials involved in the building’s restoration efforts were also invited to the gala, including retired City Manager Fred Enderle; Tom Zechman, the project manager of the restoration; and project manager Bob Graeser, who is still with the city of Piqua. All of the proceeds of the gala will go toward the maintenance fund for the building, Koon said. The engraving on the side of the building distinguishing it as the Orr Statler Hotel references William P. Orr, an industrialist who owned between 20-30 businesses, and S.K. Statler of a pioneer farming family. The original cost of building the hotel in 1891 was $200,000, which adjusted for inflation, would be around $5.5 million today. According to Piqua Public Library Director Jim Oda, the last remodeling of the building was done in 1914. In the 1890s, the building was host to the Piqua Anti-Saloon League, which lobbied for Prohibition, and later housed the Rathskellar in the basement of the hotel in 1932, acting as a bar during Prohibition. A number of U.S. presidents have visited the hotel, including William McKinley, Theodore Roosevelt, William Taft, and Warren G. Harding. Oda said that they would go out onto the balcony and speak to crowds there. The building also played a part the northern Civil Rights Movement in 1947, when the local chapter of the NAACP held a sit-in at the union bus terminal where Mulligan’s Pub is currently located. https://www.dailycall.com/wp-content/uploads/sites/30/2018/11/web1_111618mju_fortpiquaplazegala1.jpgMike Ullery | Daily Call A capacity crowd fills the Fort Piqua Plaza Ballroom as the community celebrates the 10th anniversary of the grand opening of the facility on Friday. https://www.dailycall.com/wp-content/uploads/sites/30/2018/11/web1_111618mju_fortpiquaplaza_gala2.jpgMike Ullery | Daily Call Ruth Koon, who was part of the committee to undertake the renovation of the Fort Piqua Plaza, addresses the capacity crowd in the Banquet Room on Friday during the 10th anniversary gala.